Review: Have you ever wondered how to trap a zombie, or kill a medusa? 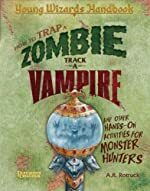 If so, then you should read How to Trap a Zombie, Track a Vampire and Other Hands-On Activities for Monster Hunters by A.R Rotruck. As soon as you start flipping the very first pages in the book, you will immediately be pulled into the story. Throughout this book, there is a wide variety of mythical creatures and the information you could ever want to know about them. One of the creatures in the book is the goblin. In the brief paragraphs about goblins, it reads "sometimes known as the mosquitoes of the monster world." On every page (including the goblin page), there is a fun activity you make and play, use, trap, etc. I liked this book mostly because of the fun activities tucked deep inside the book. Not only does this book explains about a specific creature, but it also explains how to trap, kill, and banish a creature. Do you have an unfriendly ghost in your house? Or maybe you are curious as to how to track a vampire? Look deep inside this book and follow the directions EXACTLY to how they are written. You might even get lucky enough to catch a werewolf. This book is suitable to any person who can handle unusual creatures. I suggest this book to anyone who enjoys fantasy books involving the mythical creatures that live within feet of you. Also, to any child who has a mind that wanders. How to Trap a Zombie, Track a Vampire and Other Hands-On Activities for Monster Hunters taught me multiple useful and handy tips about the mythical creatures of the world and I think it will teach you too. Review written by Krystyna (6th grade student). We would like to thank Raab Associates for providing a copy of A Young Wizard's Handbook: How to Trap a Zombie, Track a Vampire, and Other Hands-on Activities for Monster Hunters for this review. Have you read A Young Wizard's Handbook: How to Trap a Zombie, Track a Vampire, and Other Hands-on Activities for Monster Hunters? How would you rate it?